* All ten fingers supported! Sorry about the ugly formatting. I tried my best! I'm posting this here as I just finished the first public version of the project. This is the largest FASM project I've written so far (7150 lines total). Feedback is appreciated, especially if you have a fingerprint reader and can test that the basic functionality works. Don't get too upset if it does not work, I've been able to test only 3 fingerprint sensors during development. It's probably worth noting that the current version requires Windows 10 (see README.md in Github for more information why). Future plans include adding Win7/Win8 support. Hi, I would like to know, is it possible to register more than 10 finger print? eg. 70 unique finger prints? This is possible at least with the few fingerprint readers that I've tested. 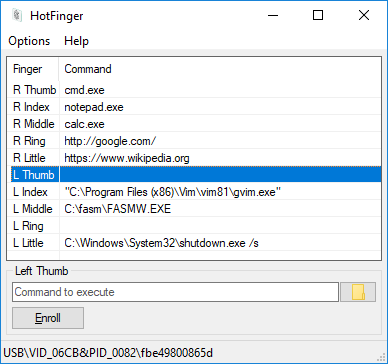 The readers save fingerprints indirectly via Microsoft's WinBioStorageAdapter.dll to a database file named C:\Windows\System32\WinBioDatabase\[DB-GUID].dat. There seems to be no limit on how many fingerprints one WinBio database can contain. It depends. AFAIK some fingerprint readers support storing the fingerprint database on the sensor hardware or TPM. However, I have not tested such fingerprint readers and they may or may not work out-of-the-box with HotFinger. 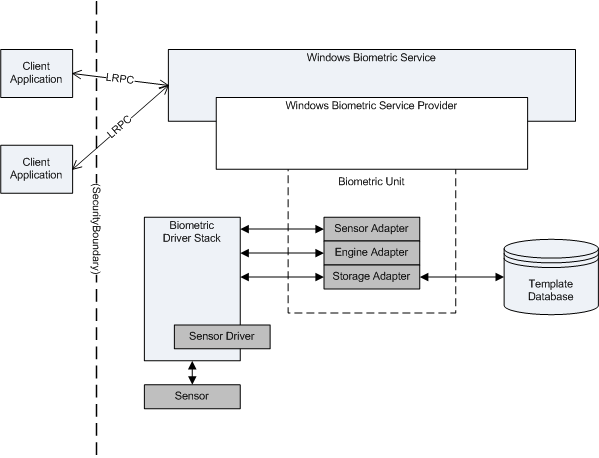 In theory they should work since HotFinger uses standard WinBio API to manage fingerprints, and WinBio framework in turn stores & loads fingerprints using the storage adapter DLL provided by Microsoft or the manufacturer of the fingerprint reader. If the fingerprints are stored on the fingerprint reader device using custom storage adapter DLL, then some storage limits may apply. The architecture of WinBio framework is illustrated in the attachment. Note that client applications do not use LRPC directly; instead they call API functions exported by WinBio.dll which then performs the LRPC communication. not sure if it could link up eg, sign in from smartphone and verify inside a windows 10 laptop running sort of fingerprint server, that able to verify stored fingerprints?